As the holiday season begins, we have to be mindful of the upcoming budget season for the District. In an effort to make sure our leaders in the community voices are heard during the budget process, Councilmember Anita Bonds would like to invite you to participate in a Community Action Budget Workshop. During this workshop, you will be able to engage in dialogue with District Agency Department Directors on what your funding priorities are for your community and the city in Fiscal Year 2015. Councilmember Bonds will be hosting the first Budget Workshop on Saturday, December 7, 2014 at the Department of Employment Services (DOES), 4058 Minnesota Ave NE at 9:00 a.m. – 12:00 p.m. At this workshop some of the topics that will be discussed include Affordable Housing, Rental Assistance and Workforce Development (Job Training). 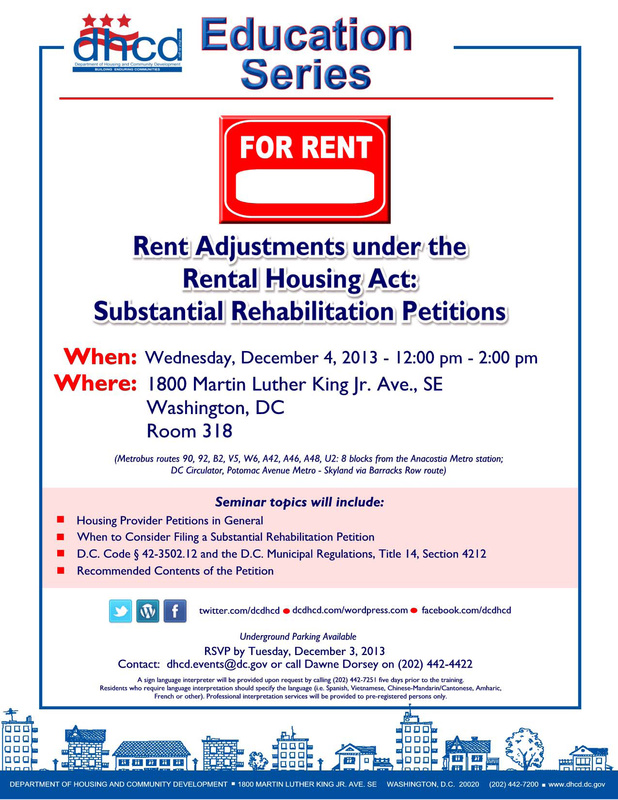 We will be joined by Director Michael Kelly, Department of Housing and Community Development; Director Lisa Mallory, Department of Employment Services; and Director Adrianne Todman, Executive Director DC Housing Authority. The Green Area Ratio (GAR) is a new environmental zoning regulation in the District of Columbia that became effective on October 1, 2013. The Office of Planning and the District Department of the Environment are offering free training seminars on the GAR. Each seminar will provide an overview of the GAR, the plan submittal process, the GAR Guidebook, and the role of the Certified Landscape Expert. Information about the GAR is also available at http://ddoe.dc.gov/GAR. All GAR training seminars will be conducted at the District Department of the Environment, located at 1200 1st St NE, Washington, DC. Please contact me at matthew.espie@dc.gov or 202-715-7644 to sign up for a GAR training date. On Saturday, November 16, from 10 a.m. until 1 p.m., Pepco Energy Services (PES) will host an Open House where nearby businesses and residents can get information about the demolition of the Benning Power Plant. The Open House will feature exhibits about the demolition procedures and schedule. Representatives from PES, Pepco and its contractors will be available to describe the measures to ensure public safety throughout the demolition process and answer your questions concerning air monitoring, site water management, traffic, and demolition methods. This Open House will be held at the District Department of Employment Services, 4058 Minnesota Ave., NE, Washington, DC 20019. Interested residents and businesses can drop in anytime between the hours of 10 a.m. – 1 p.m. for information. The DC Department of Parks and Recreation (DPR) will convene a series of open community meetings to offer the public an opportunity to comment on proposed changes to DPR’s permit fees and regulations. At the meetings, DPR will solicit opinions on a proposal to revise its permit fees from a flat rate to an hourly rate, and to discuss a plan on a new “fee-based use” permit for applicants who charge their participants for activities and for priority of use. DPR plans to examine the use of its facilities for fund-raising activities, the sale of foods and beverages, and to establish procedures that comply with District of Columbia law, and allow clear guidelines for these commercial activities. DPR manages permits for the facilities used for games, practices, community meetings, and other special events. If a resident is unable to attend any of the meetings, written comments may be submitted to the Constituent Services and Permits Manager Jacqueline Alvarado at Jacqueline.Alvarado@dc.gov. All written comments must be submitted no later than Thursday, December 5, 2013. The ANC meeting tonight meeting will be held tonight. The Commission meets at 7:00 pm on the 2nd Thursday of the month at 5109 Nannie Helen Burroughs Ave NE (Sargent Memorial Presbyterian Church).